This is what happens when a Boulderfist Ogre REALLY wants attention. I still dont understand why doesnt this hit all minions. I mean its an epic card and it would be perfectly balanced that way. now its just a crappy card. Well then it would basically be Flame Leaviathan. They probably didn't want to make it too similar to a legendary. Should just have more stats than Boulderfist. Exept if you have a lot of enrage minions in your deck. I'd rather it just have better stats for the "downside." It feels like it should be a card with a downside that justifies more value, and can be an upside in the right deck. BattleTag: Actually, I'm not a pig. See Terrorscale Stalker and Princess Huhuran. I completely agree with you, though. To top it off, your oponent knows that you have drawn it. 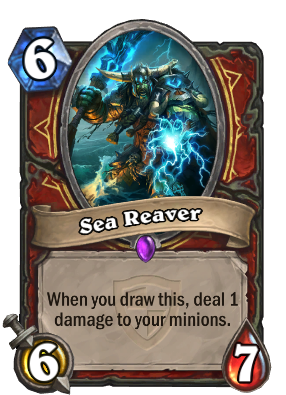 Maybe if this was a 8/8 for the 6 it'd see play but unless something new comes up I doubt anyone will ever use this card. Does anyone else see any good application for it currently? I had no idea this card existed until a priest used it as a product of Mulch earlier this morning. The card art is beautiful (especially golden, gahh) but sadly I think that the only reason I'll ever see it is due to cards like Mulch or Unstable Portal as no one's going to purposely put this in their deck! It only procs if the board is full and it goes into your hand. Yeah, DisguisedToast tested it and i saw it now. It just seems too unreliable, and I can't help but feel that warriors can do something better with 6 mana, or just use the card slot in a much better way. It'd be more desirable if the effect was treated as a negative rather than a positive (which, given its unpredictability, it could be) and offset the cost. It's also not helped by the fact that the damage will often occur at the start of your own turn, which is the worst time; too soon to load up the board with cards that would benefit from it or play Warsong Commander, but too late to avoid summoning sickness for patrons. In other words, if it cost 5 instead of 6, it'd immediately be way more appealing. Flame Leviathan 2.0.